Don't you wish you had more time? 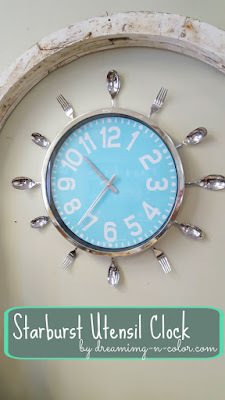 Well I can't help you there but what I can do is show you how to keep track of it creating this trendy Starburst Clock. If you look in all the magazines lately you will see another "old" trend resurfacing. Starbursts! 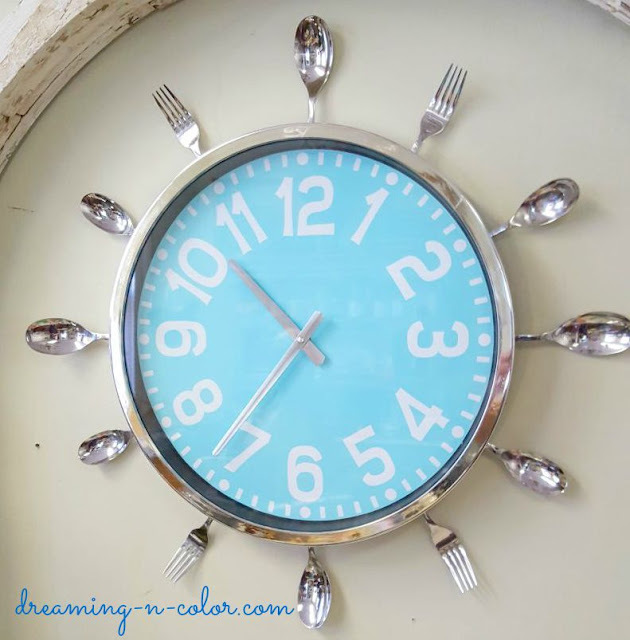 Starburst mirrors, clocks and wall decor. The are made from everything, wood, metal, and various objects. If you look at this trend you will also notice they can be quite pricey. When I see something too trendy I decide it is better to make it myself. It saves money, period. This is not always the case but when you shop smart you can make some affordable decor. I love the ease of this project too. There are few supplies and steps to achieve this look. On my little shopping excursion to Old Time Pottery I fell in love with these clocks and the colors available. Turquoise is another trend right now and boy do we love it! 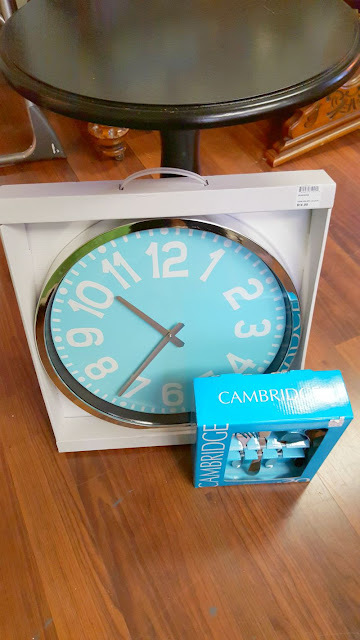 I found a 16" clock that was turquoise with white numbers and silver chrome casing. This is how I got started. There were all types of silverware. I went with a complete set so I had different sizes and varieties. 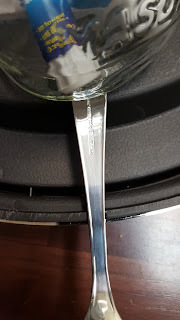 Large and small forks and spoon. I left the knives out this time. I matched the chrome with the clock casing. You may notice a table in this picture. I am going to use this too. 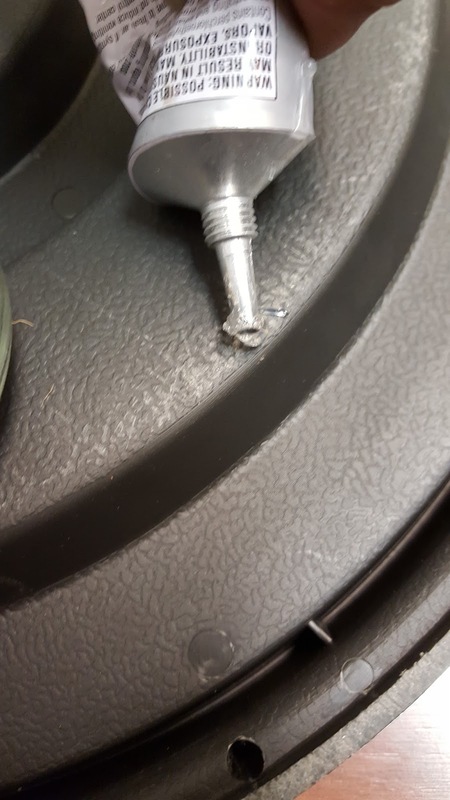 Lets just say you are getting two for the price of one project today. You can choose your favorite! 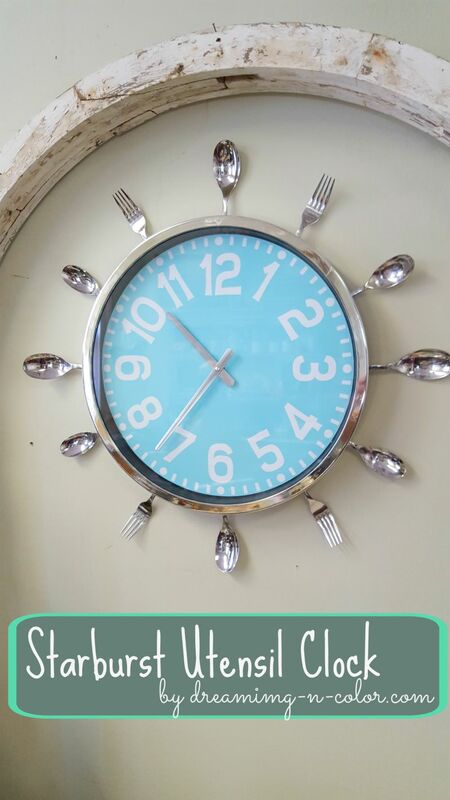 One important thing to have on hand for this Starburst Utensil Clock is E6000. The glue will set the silverware firmly to the back of the clock. Choose which utensils you want to use. To keep them spaced apart I used the minutes on the clock as my measuring guide and a sharpie to mark on the side where I need to glue. This help so there is no flipping the clock back and forth. Use something heavy to place on top of handle. The weight will help the piece adhere to the glue. Let dry overnight. And remember the table from above. It is a 15" inch round. The 16" clock fit perfect on the top of it to make it in to a clock table. Talk about simple! I love the look and it fits perfectly. So there you have it. A clock used in two trendy affordable ways. 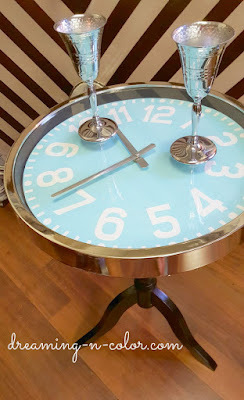 Some great home decor or back to school furniture.